The passenger compartment remained stable during the frontal test. An airbag mounted under the steering wheel provides protection to the driver's knees and femurs. The passenger is restrained from forward movement by an underseat airbag as well by the conventional seatbelt. Both systems worked effectively, readings from the dummies' knees indicating good protection. Toyota showed that a similar level of protection would also be provided to occupants of different sizes and those sat in different positions. The car scored maximum points for protection of the passenger. In the pole test, rib deflections measured by the dummy led to the chest protection being rated as marginal. Marginal protection was provided against whiplash injuries. In the first side barrier test, part of the ISOFIX attachment broke on the child restraint containing the 3 year infant, although the car's anchorages remained intact. Toyota identified the problem as a change of material by Britax-Römer. Duo Plus child restraints ordered through Toyota dealers will now have an improved material specification. Toyota will contact the owners of all iQs and offer them a replacement restraint if they have already bought a Duo Plus for use in their car. On the basis of this action, Euro NCAP allowed a retest. In that re-test, Toyota's counter-measure proved effective and the child restraint remained properly attached to the ISOFIX anchorages. However, the head of the 3 year old was not contained by the side of the restraint and made contact with the seat of the 1½ year old. Britax-Römer have improved the user's manual and labels of all Duo Plus child restraints to avoid the risk of adverse loading on the ISOFIX attachments as a result of incorrect child seat installation. The passenger airbag can be disabled to allow a rearward facing child restraint to be used in that seating position. However, information provided to the driver regarding the status of the airbag did not meet Euro NCAP's requirements. However, there is a clear warning given of the dangers of using a rearward facing restraint in that position without first disabling the airbag. The presence of ISOFIX anchorages in the rear outboard seats is not clearly marked. 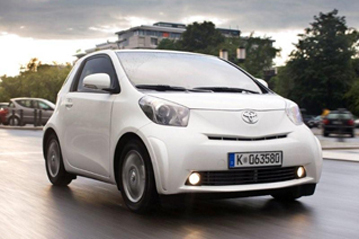 The iQ scored maximum points for the protection offered to pedestrians' legs by the bumper. The bonnet provided mostly good protection in the areas likely to be struck by an adult's head but was predominantly poor for protection of a child's head. Electronic stability control is standard equipment in all European countries. A seatbelt reminder system covering front and rear seats is also fitted as standard.